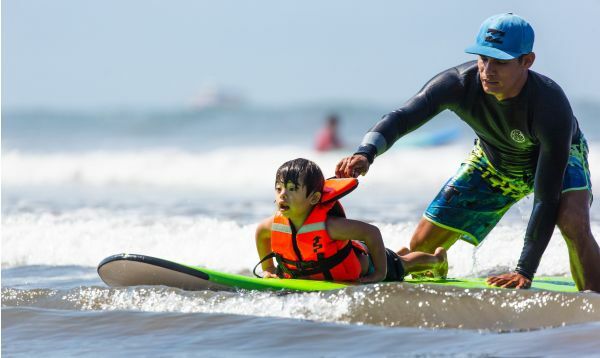 On March 14, top surfers from local surf schools, including Sayulita Surf Co., Sayulita Surf School, Okala Vallarta Surf School, and Tron and Bucerías Surf & SUP, patiently helped 25 children from Pasitos de Luz learn to ride the waves. 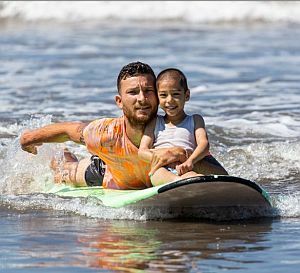 Puerto Vallarta, Mexico - Surfing with Nixon is the leading charity in the US to promote surfing as a form of therapy for children on the autism spectrum. Since 2014, the charity, founded and lovingly run by the couple Daniel and Shari Romney, has hosted free surf days for hundreds of children on the autism spectrum. Each year their surf events get bigger and bigger, as more parents realize the benefits that surf therapy can bring to their kids. The couple knows all about having a child with disability and the challenges it can pose for a family. Nixon is their son. He is 11 years old, is on the autism spectrum and also has other special needs. He was born deaf, is non-verbal and only recovered his sight at age 3. He has Cerebral Palsy. That is a lot to contend with for any parent. However, both Daniel and Shari were determined to identify the things that Nixon loved doing, and surfing just happened to be top of that list! Fast forward to March 14, 2019, and Daniel, Shari and their young family (Nixon is one of four siblings) are on the beach in Nuevo Vallarta, Mexico, to run the first ever Surfing with Nixon day outside the US. Riviera Nayarit is world-renowned for its surfing spots and so was the natural choice. Twenty five kids and thirty professional surfers were all set to hit the water and ride those waves. Daniel had contacted Pasitos de Luz, a local and much-loved daycare and therapy center for Puerto Vallarta kids with disabilities, to see whether they would like to take part. 'Of course!' was the answer. Pasitos supports children with disabilities from low-income Mexican families, offering completely free therapy and daycare to children with autism spectrum conditions, Down Syndrome, learning disabilities, Cerebral Palsy, among many others special needs. They do all this with no government or local authority funding. Before Surfing with Nixon, some of these kids had never been on the beach or experienced the sea, and so this was a first-time experience for them. They absolutely loved it! For three hours, top surfers from surf schools including Sayulita Surf Co., Sayulita Surf School, Okala Vallarta Surf School, and Tron and Bucerías Surf & SUP, patiently supported kids as young as 3 to lie on their board, face forward and ride the waves. Some of the older children, including 17 year old Kapila who has Asperger Syndrome, managed to stand up and ride all the way to the beach. All the children and surfers had huge smiles on their faces. So what's next for Surfing with Nixon in Riviera Nayarit? Daniel and Shari's dream is for this to become an annual event, involving more local charities, benefiting more children and raising more awareness in Mexico about surfing as a great therapy for people with disabilities. They would also like to bring on board (excuse the pun!) some major sponsors, such as Quiksilver, Roxy and Hurley, to make this dream become a reality. So keep an eye on the beaches of Nuevo Vallarta for the next Surfing with Nixon event! Located in El Pitillal, Pasitos de Luz is a marvelous day care facility for children with special needs. This non-profit organization provides children with various handicaps with a caring and loving environment, along with treatment for individual rehabilitation, nutritional meals, physical stimulation and therapy. For more information, Click HERE or visit PasitosDeLuz.org.